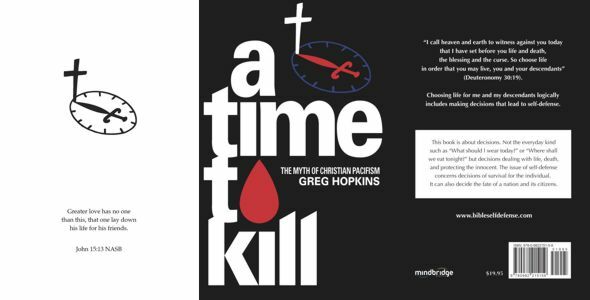 A Time to Kill: The Myth of Christian Pacifism is about decisions. Not the everyday kind such as “What should I wear today?” or “Where shall we eat tonight?” but decisions dealing with life, death, and protecting the innocent. Self defense concerns decisions of survival for the individual. It can also decide the fate of a nation and its citizens. This book is better then I anticipated. The information flows very well and is easily understood. I was on the fence…. being a Christian, I always considered Christ to be a Pacifist. This book thoroughly debunks this myth for what it is. If you are on the fence like I was, this book is for you. If you have any questions about your responsibility as commanded by the Bible this book is for you. If you are simply an owner of a concealed carry permit this book is for you. It will answer your questions from every angle. Straight forward answers for today’s “gun control” dilemma. Greg Hopkins received his first firearms training as an auxiliary police officer in his hometown of Waverly, Ohio, where he served on the city council. He earned his law degree at The Cumberland School of Law in Birmingham, Alabama, and served there as a City Magistrate. After graduation, he clerked at the Alabama Court of Criminal Appeals and was admitted to the bar in 1989. Greg served as City Prosecutor for Huntsville, Alabama, and he trained the Huntsville Police Department in legal use-of-force. He received training for police advisors at the FBI Academy in Quantico, Virginia, and completed Level One of Massad Ayoob’s Lethal Force Institute in Pearl, Mississippi. After leaving the City Attorney’s office, he practiced criminal defense law, served as a City Court Judge, and became a court-certified expert witness in firearms and self-defense law. Greg regularly consults on self-defense and firearms cases to analyze and reconstruct crime scenes. He is a nationally certified instructor in Use-of-Force and Pepper Spray by the National Criminal Justice Training Council of Twin Lakes, Wisconsin. He is a Life Member of the National Rifle Association and has been a certified NRA Pistol Safety and Personal Protection Instructor since 1991. Greg has trained police and civilians in use-of-force law for 21 years. He teaches legal seminars on self-defense law, effects of violence on witnesses, and effects of Post Traumatic Stress Disorder (PTSD). He has taught Bible classes to adults since he was 18.